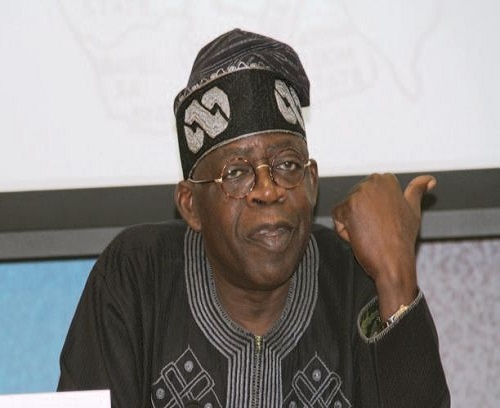 Asiwaju Bola Tinubu, a national leader of the ruling All Progressives Congress (APC), has rejected an appeal to him by the party to lead the national campaign of President Muhammadu Buhari for the 2019 presidential elections across the states of the federation, the media has learnt. According to our source, “Tinubu has politely rejected the request to lead President Muhammadu Buhari’s campaign for the 2019 elections. Rather he has chosen to focus his attention more on the South-West. “I also heard that he wants to concentrate his efforts on assisting his candidates. In Ogun, Governor Amosun has withdrawn support for Dapo Abiodun, who is Tinubu’s loyalist. He will also be actively involved in trying to retain Lagos for APC especially given the fact that Babajide Sanwo-Olu, the party’s candidate is contesting against a Jimi Agbaje, who is an experienced politician”. In a related development, the APC on Tuesday described as untrue that party supporters in Imo, Ogun and Zamfara states have vowed to boycott President Buhari’s campaign in the affected states. Speaking with Daily Independent, Mallam Lanre Issa-Onilu, the party’s national publicity secretary, said the APC supporters in the affected states are happy with the party leadership for putting an end to impunity and giving back power to them. “I am not aware that the people of Ogun said they will not vote for President Buhari. If anything, they are so happy with the step that APC has taken. Because what APC has done is to say ‘enough is enough with impunity’. “The APC said power should go back to the people and they should be the ones to decide their representatives. So, is it the people that we empowered and gave back power to that will now be moving against the party? People of Imo are happy with what the APC leadership has done. “It got to a stage that they were telling us that even if you bring a cow, as long as it is not by impunity, we will support it’. Good enough, we are not putting forward a cow as there are many credible candidates who can fly the party’s flag. “Even Okorocha has said he remains in APC. His son-in-law is another person entirely. The son-in-law cannot on the day of election vote with Okorocha’s PVC. People are free to take decisions. But the question to ask is the decision you are taking is it driven by public interest, the best interest of your people or driven by greed and selfishness?” Issa-Onilu queried. Uche Nwosu, son-in-law to Imo State governor, Rochas Okorocha, has dumped APC for Action Alliance (AA). Nwosu made this known on Tuesday when he spoke to newsmen at the Sam Mbakwe International Cargo Airport, Owerri. Meanwhile, Prof. Itse Sagay (SAN), Chairman, Presidential Advisory Committee Against Corruption (APC), has described as unconstitutional the threat by Comrade Adams Oshiomhole, national chairman of APC, to sanction aggrieved party members who approached the courts to seek redress over the outcome of the controversial primaries. In a message sent to Daily Independent on Tuesday titled ‘Let the APC Chairman and the NWC of the Party be Warned’, Sagay said President Buhari was right when he said members of the party who feel aggrieved should seek redress in courts. The statement reads, “Arising from the crisis ridden primaries of the APC all over the country, many aggrieved aspirants for the party’s nomination at all levels (with the exception of the presidency) have gone to court to challenge the party’s decisions which they firmly believe, robbed them of their victories and awarded the nomination to other persons, whose common identity, is that they are nearly all money bags with equally heavy moral baggage, who had held offices and positions in the PDP. “Most of them are last minute defectors from the PDP, having failed to get their party’s nomination or were scared away from contesting for nomination in their party because of the strength of the opposing contestant. Most of these alleged primary ‘victors’ are past, long standing governors and senators, etc. of the PDP who parachuted into the APC at the last minute to pursue their selfish ambitions. For them, the APC is merely a convenient platform for actualising their post governor/senator ambitions. They have absolutely neither affinity nor empathy towards the APC. “All this is quite in order in an underdeveloped democracy like Nigeria’s. However, what is absolutely not acceptable is the threat to expel the aggrieved aspirants for taking their grievance to court in search of a judicial resolution. The threat to expel them is absolutely illegal, both under the common law and under the Nigerian constitution. “Under the common law, any provision in any agreement which purports to deprive the parties of their right to resort to the courts for the settlement of any dispute arising out of their transaction is void on the ground of public policy. This is a long established principle of law and I am surprised that the APC Legal Adviser did not inform the NWC that the attempt to bind the hands of aggrieved party members by ousting the jurisdiction of the courts is a nullity and an act in futility. “Even more devastating to the position of the APC NWC is section 36(1) of the 1999 constitution, which gives everyone a right of fair hearing before a court or a tribunal established by law for the determination of civil rights and obligations. “So the president was very right when he urged every one of the aspirants who felt cheated or defrauded, to go to court. The vain and impetuous declaration by the embattled APC NWC to still expel members exercising their inalienable common law and constitutional rights, in spite of the president’s directive, is a clear exercise in childish futility; a precursor of major humiliation. “So, the chairman and members of the NWC of the APC are warned to heed the advice of the president or risk exposing themselves to a major embarrassment.